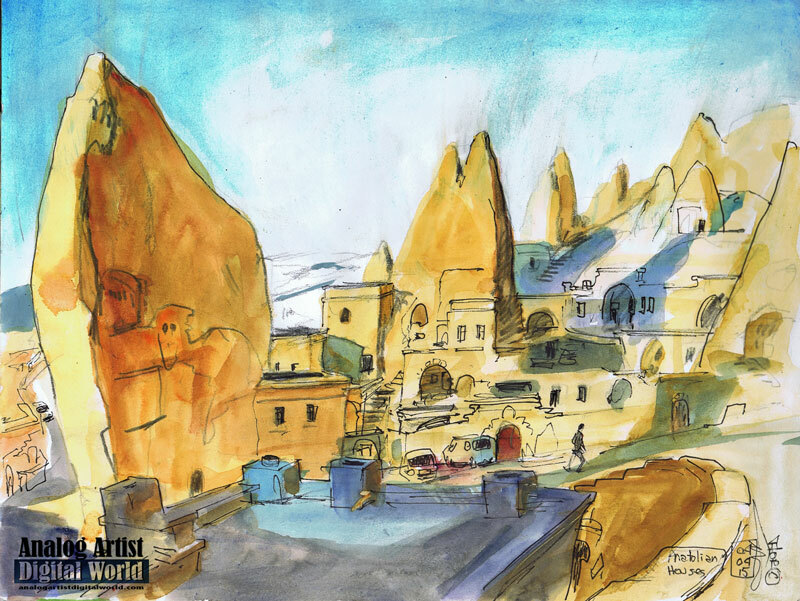 Analog Artist Digital World: The Anatolian Houses Hotel in Goreme Turkey. On our trip to Turkey, Terry and I stayed in the Anatolian Houses Hotel (50180 Nevşehir Merkez/Nevşehir, Turkey) in Goreme. Our room was in the stone building attached to the large sandstone structure on the left: The living room was in the building and the the bedroom and bathroom were carved out in side the sandstone. It was like living " a very modern well a point cave. The bathroom had large jacuzzi tub and very tiny windows that can be seen on the cliff face. The walls had plenty of carved out niches for storing towel and clothes. In one section of the bathroom, the floor dropped and and a glass plate was used to maintain the flat floor surface. A light was placed down in the crevasse to illuminate the ceiling. On one occasion, I had to run back into our suite, because I forgot something. While running out of the bathroom, I smashed my forehead against the bathroom doorway. I was dazed for a bit but recovered, simply cursing my stupidity. Goreme is well known for it's hot air balloon rides. We didn't splurge on the balloons, but they brightened up the sky every morning.